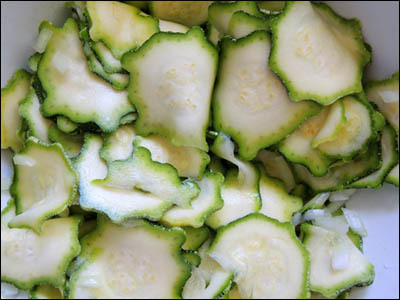 Thinly slice the zucchinis using a sharp knife or a mandolin. Place these in a bowl with the finely-chopped onion and sprinkle with the salt. Cover with ice-cold water, stir to dissolve the salt, and leave for 1 hour. Drain the zucchini well and pat dry using a clean tea towel. While the zucchini are soaking, add the vinegar, sugar, mustard powder, mustard seeds, celery seeds, habanero and ground turmeric to a preserving pan and bring to a simmer. Allow to bubble for 3 minutes, stirring to ensure the sugar is dissolved, then allow to cool until just warm. Add the zucchinis and stir. 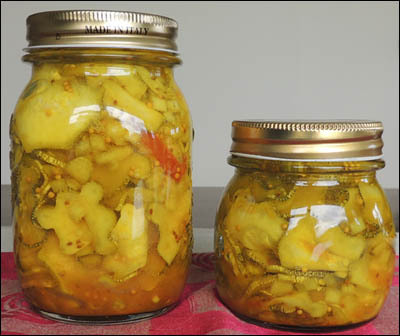 Add the pickle to sterilised jars. I then used the water bath method to finish off this recipe. This will make approximately 1 litre of the pickle. For this recipe I used the zucchini, Costasta Romanesco as it’s the only zucchini I grow these days. Not only does it produce the huge male flowers useful for stuffing and deep frying, but the texture and flavour of the flesh is far superior to that of regular zucchini. Adapted from the ‘Crunchy Courgette Pickle’ recipe, posted on the BBC Good Food website.